Why the Boston Red Sox must care about the AL Wild Card pitching matchup. Today the 2014 postseason officially begins and the Red Sox will not play a single game, so why should we care? October baseball will open tonight with the American League Wild Card game, and after several weeks of drama between Kansas, Detroit, Seattle and Oakland, the teams that will fight for a spot in the ALDS against the Angels are the A's and Royals. The pitching matchup between these two teams will feature James Shields fighting for Kansas and ex Red Sox ace, Jon Lester. For the record, both pitchers will be free agents when this season ends. As our contributing writer Mike Davis wrote in his article last week, the Red Sox should at least make James Shields a decent offer to join the 2015 team. The Royals ace has a decent 3.21 ERA this season with 14 wins, 8 losses and 227.0 innings pitched. He also has a 19.2 strikeout percentage and his opponents hold a .253 batting avg against him. The A's will have our beloved Jon Lester on the mound, with a 2.46 ERA, 16 wins, 11 losses and 219.2 innings pitched. His strikeout percentage is at 24.9% and his opponents have a .233 avg against him. Lester's numbers are slightly better than Shields' and give him a strong candidature for the Cy Young Award. Given the fact that the Red Sox do not like spending on long-term contracts and Lester has proven to be able to become an ace to another team, the chances of having him back are really slim. When the Red Sox traded Jon Lester and Jonny Gomes for OF Yoenis Cespedes and John Lackey for OF/IF Allen Craig and P Joe Kelly, they gave away two of the most (some might say the only) reliable pitchers they had. Now that the free agency is knocking GM Ben Cherington's door and he recently stated that the Red Sox are looking to add to the rotation, bringing back Lester and/or adding James Shields surely are excellent options. Tonight's American League Wild Card game is having a highly-possible future Red Sox pitcher on the mound, and it will be the last start of one of them. Let's take a look at it and see who will realistically can has a shot of being a pitcher for the 2015 Red Sox. Who are you rooting for on tonight's game? Do you think the Red Sox will be able to bring Jon Lester back? 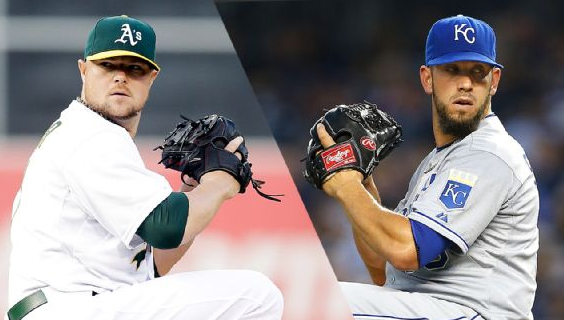 If the Red Sox get James Shields, will he be a solid first starter of the rotation as Jon Lester was? Leave your comments below.